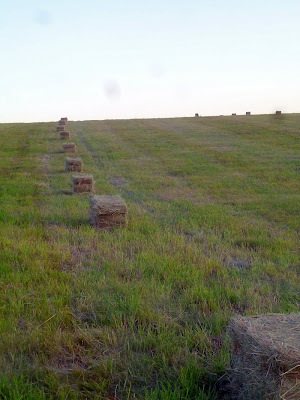 Rural Revolution: The hay is baled! Every year, the absentee owner of a 25-acre pasture kitty-corner across from our property lets us bale the grass hay for winter feed. For the last couple years the grass was too thin to make it worthwhile but this year the standing grass was better, due to our wet spring. So we had the field mowed. We don't own any mowing/raking/baling equipment, so we can't do this work ourselves. We hire a local farmer to do it for us, but first we must mentally balance the cost of labor with whether or not it would be cheaper simply to buy our hay from someone else. This all depends on hay prices, etc. It's a gamble. After the grass hay is mowed, it lies on the ground for a few days to dry. (This is another gamble, namely that it doesn't rain and ruin the cut hay.) After that, the rows are raked into larger 'windrows' to make baling easier. Here's the farmer's double windrow rakes. He lost a tire on one of the rakes which delayed work for a couple of days. Eventually he got the rake fixed and started forming windrows, which are higher, deeper, fluffier rows of grass hay. Here's the hay, raked into windrows. It's now ready to bale. Scenery like this is, to me, gloriously beautiful. Here the farmer has brought his ancient baler. This year we're getting small bales (about 50 lbs.) instead of large bales (1000 lbs). Altogether between the two fields we got nearly 750 bales of hay. Anyway, we wanted to find out how much each bale weighed so we could more accurately determine the overall tonnage. So we took a sample bale back to the house. ...and got a rough weight of about 55 lbs each. If its any consulation that is about half what it would cost to purchase it here, this year. You also know what you are getting plus the immeasurable pleasure of watching th whole process. Ugh. We're paying between $6 and $7 for a bale of hay about that size. Sure does make me miss the 100-acre hayfield we had up in Georgia! 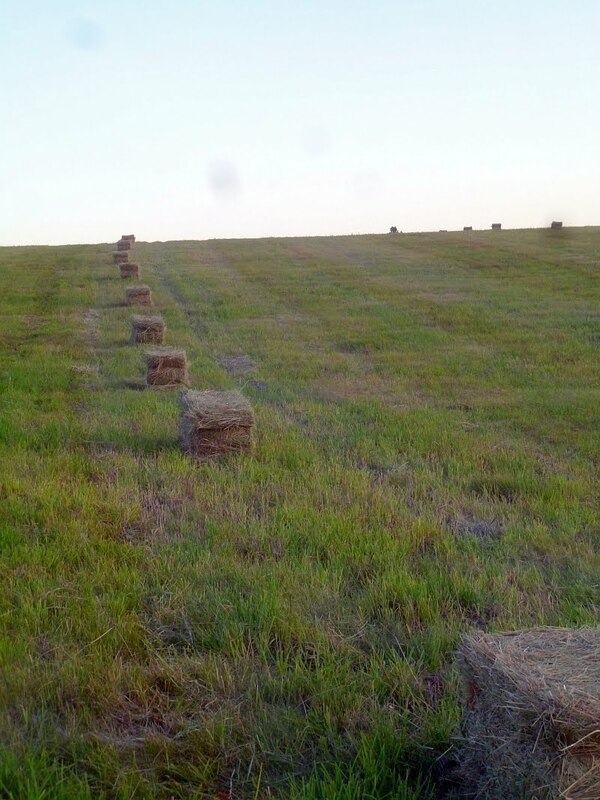 A hay contractor would mow and bale it for half the hay. That one lil' pasture got us through the winter with more than enough hay. *sigh* It was too much for us to both work full time and run back and forth to a farm across the state line, though. Agri-life in general is a gamble. Some years you win, some you lose. I'm afraid with our ongoing drought in central Texas, hay will be at a premium and hard to come by. Hay here costs 100+/ton so I feel you got a good deal. But it all depends on what hay is going for there. I know for a bale that size at the feed store I would have to pay %13 so to me that is a good price. I am going to have to get hay this year for my goat and am still deciding on how much I need to get her through the winter. She is grazing now and hardly eating any hay at night , only in the bad weather when I keep her in. Might let her have free rein when it rains and see if she will go out and eat. I looked at this site http://www.ams.usda.gov/mnreports/ml_gr312.txt and was wondering how those prices compare with your numbers. I know nothing about this, but was just hoping you did better than a lot of us did today (except for the pm's). Some of us needed needed some pretty pictures this evening. In our area winter hay runs around $20.00+ a bale. They weight 50-100 pounds, depends who you buy from. We don't have any lifestock currently. When we did we would go to the farm and load the truck an trailer ourselves. This was a few bucks cheaper. It may or may not have cost a bit extra this year, but think of it another way. You hired a farmer who might have needed that extra money to stay afloat this year. If you had not, and he went under this year, you might not have been able to hire anybody at all when the time came that it was truly needed because hay was not available for sale at any price. It seems so expensive, doesn't it - I remember buying good Bermuda coastal for 1.65 a bale, not so long ago! One thing that was important to us, and I don't know if it's as important in ID, but the smaller bales seemed to reduce waste. Large round bales here tend to mold, and animals would become sick especially if the heat persisted as it's wont to do. I guess I agree with Shanti on this one - some things are cost effective in more ways than one. My goodness that takes me back many years. I'd toss hay bales onto a flat bed truck and then into a hay barn. I think I got 10 cents (maybe 25) per bale. HOT work, hard work every summer while I was in High School. Memories of how hard I worked kept me going when I was in college! I figured I'd be better off using my mind instead of muscle (Engineering rather than haying). in the summer of 1968, my father was temporarily unemployed. the only job to be had was helping with the haying. well, the pay was a nickel a bale-he had all four of us children out there in those fields and barns with him to help earn enough for a family of six to supplement the government commodities we were receiving. now, that was survival of the fittest..kids today have no idea what they may be in for. Well said. Interesting that we all long for the "good ol days" as we stress out over the stock market, the economy and how the kids in cities are being raised. Bucking bales may in the log run be "God's work". Time to get those bales in the barn. You're not out of the "rain-woods" yet. I think big fluffy windrows are beautiful, too. $75.00 a ton is a bargain...you made out good. Hay prices are over $200.00 a ton in some areas already. Great photos also! Oh, I agree that hay bales make great pictures. :) I love the way they cast long shadows across the field when the sun is low in the sky. Those old mechanical hay balers are fascinating! I wish you had taken pictures of it in action. Was it like this one that I blogged about a couple of summers ago? Oh, and Anonymous at 9:28 PM, in a good year they can even get 3 cuttings! I remember a couple of summers like that not too long ago. I've never known anyone in this region to get a second cutting of hay. We just don't have the rainfall to support it. Our summers are fairly dry, though we can usually expect some rain at least once a month. This year, not so much. 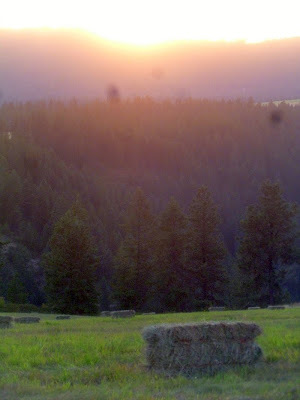 We haven't had any rain since mid-July, and then it was so light that it hardly mattered. Our rain ended in early June, and for the most part that's been it. Interesting... but I don't see what you are basing your conclusion on. Can you buy bales right now at $75/bale or less? Or are you basing your conclusion on last year's prices? Better to have it in your barn (whatever the price) than to not be able to obtain it later when you really need it. The drought is SO BAD here in Okrahoma. The farmers are calling everywhere looking for hay for their cows as everything is burned up from the heat. That means feeding their herds hay now and all the way through until next spring. That's too long and too expensive. The price on any available hay is only going to go up. In contrast, you're ready. No need to second guess yourself. You did well! $150 to $200 per ton in the field in Ohio 1st cutting, 2nd cutting will be more. Yes! I think you did well to have it custom cut for you. My husband is a farmer/rancher here in Eastern Washington, not too far from you. He says that hay is going for $200/ton or more this year. We sold some to a neighbor for around $150, just to be nice. So, I think you should be very grateful for spending only $75/ton this year. We are able to get 3 cuttings per season, but that is because we have irrigated hay, not dryland. Hope you are able to find enough to get you through the winter, at a decent price. BTW, I am about half way through your new book "The Simplicity Primer." I love it! Basically, it is filled with a whole lot of common sense, that just isn't very common anymore. It is fun to read just how much we have in common, too!